Mexico, DF. 24th December. Today the Worldwide Festival of Resistances and Rebellions against Capitalism began in the Federal District. Despite the rain, the art, music, food and the word maintained the spirits and the interest of all those gathered together at the place for rodeos of the Charros  Reyes Association of Iztapalapa, of the Francisco Villa Popular Front Independent-UNOPII. The turn came for the Ayotzinapa compañeros. Don Mario, father of Cesar Manuel González expressed: “I am a father from an injured family that wants to recover his son. We didn’t know about this kind of event, we see the injustices and the struggles of the communities for lands and lakes.” He reiterated the demand that the government deliver the students alive because all “the times they say they have killed them, the government has fallen into the lie. 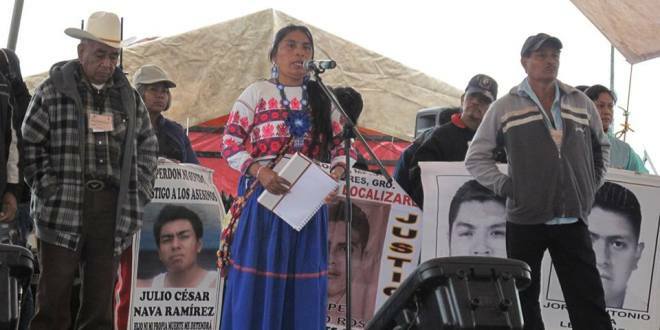 We want justice for all the people who are dead in the [clandestine] graves… for the deaths in Juárez… We didn’t know that this came from the State…. We were under the illusion that Peña would receive us, but he is a puppet that to speak he needs them to put it on paper. He is not aware of the fact that he must speak for himself.” He made an invitation to the dinner with Peña Nieto in Los Pinos at night. Doña Hilda, the mother of Jorge Antonio Tizapa thanked everyone for the affection with which they are received in each activity, and reiterated the request to the government that it delivers the students alive. Thus began the Festival, and in the different tents and scenarios artistic presentations and workshops were carried out about the different ways of resisting the capitalist economic model. Urban vegetable gardens for food sovereignty, ecological sanitary towels and nappies for reducing consumption and waste, belt weaving, engraving, painting and processes of self-management, among others. Out of diversity, the festival shows the different ways of constructing and acting collectively in the face of a system that divides and destroys. Charros are horsemen and a lienza charro is the place where a type of rodeo or show is held that involves the horsemen roping horses with lassos.